Members of the research team from the MSU Quello Center (L to R): Anne Marie Salter, Keith Hampton, Laleah Fernandez and Willliam H. Dutton. Not pictured: Bibi Reisdorf. Members of the research team from the Wayne State University Center for Urban Studies (L to R): Charo Hulleza, Jordan VonZynda, Cynthia McClure, Bianca Jones, Marco Alvarez-Patino and John Jakary. Detroit's digital divide stems more from the means of connectivity rather than from a lack of interest or access, according to a recent study of internet use by the Quello Center at the MSU College of Communication Arts and Sciences. Working with support from the Center for Urban Studies at Wayne State University (WSU), the Quello team’s project observed that while most Detroiters are online, a large percent rely on mobile-only access. The team also discovered that Detroit residents are more interested than previously thought in accessing the internet for information and educational services. "We learned so much and dispelled a lot of assumptions and stereotypes," said Quello Director and Professor of Media and Information and Policy William H. Dutton. "We also showed that affordability is indeed a big issue." "Broadband to the Neighborhood: Digital Divides in Detroit" involved surveys of 525 residents within three neighborhoods from October through December of 2017. Findings from a series of focus groups with 30 additional residents complemented the study. Four researchers from MSU's Quello Center took on the project, in keeping with the center's mission to challenge taken-for-granted assumptions about the role of technology, policy and regulation in society. 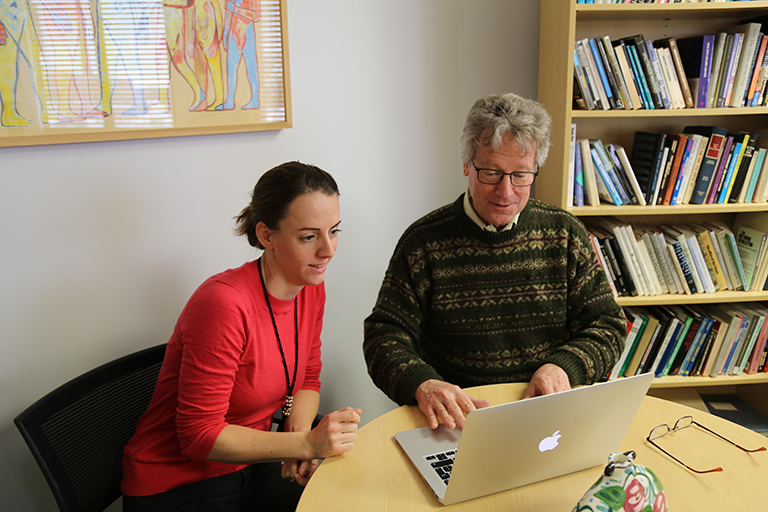 Quello Center researchers Bibi Reisdorf (left) and William Dutton (right). "While we found there is a divide in the proportion of people who have home access through an internet service provider versus those who do not, we also found that residents are quite creative in finding ways to get online," said Dutton. "We saw people going to great lengths to figure out how to do more with less when they are stretched and unable to afford access." Rocket Fiber — an ultrafast Detroit-based fiber optic company within the Quicken Loans family of companies — supported the study. Director of Strategic Partnerships Emily Dabish said Rocket Fiber's wish is to raise awareness and devise ways to address the city's digital divide. "We want to work creatively to find solutions for Detroiters and publicly share that information with various community partners who might be able to shift our connected ecosystem," said Dabish. "We hope the study deepens conversations considering the lack of connectivity in Detroit's neighborhoods and informs stakeholders around the ways that Detroiters access the internet." Dabish agreed that Detroit's digital divide has been misunderstood and miscommunicated. The perceptions exist, she said, because of the focus on fast facts that don't dig into why so many residents are without a broadband subscription. "The broadband study dispels myths involving the way Detroiters choose to connect," she said. "It reinforces that Detroiters expect companies to be authentic and affordable. Rocket Fiber wishes for the lessons of the study to be shared and that they be applied in those communities where a digital divide exists." Dutton came to MSU and the state of Michigan in 2014 after serving as the first professor of Internet Studies at the University of Oxford and founding director of the Oxford Internet Institute. As an author and editor of numerous reference works on internet studies and politics, Dutton became immediately interested in the lack of attention he saw being paid to internet access and speed in distressed urban areas. Focus Group with Adults at Central Detroit Christian Community Development. Facilitated by MSU researchers Bibi Reisdorf and Laleah Fernandez. Dutton heard of Rocket Fiber's efforts to connect Detroit's downtown business community by installing a high-speed fiber optic network. Intrigued by the company's vision for transforming the urban core, Dutton initiated conversations with Rocket Fiber leaders to explore their plans for mounting a similar connectivity effort in Detroit neighborhoods. "The internet is so significant in every aspect of life or work," Dutton said. "Not having access can be a disadvantage, and tends to follow social, economic and geographical divides. Those digital divides, in turn, can reinforce or exacerbate social and economic inequalities." With Rocket Fiber's support, the Quello research team worked alongside field research partners from WSU's Center for Urban Studies to survey three Detroit neighborhoods: Cody-Rouge, Milwaukee Junction and 7/8 Mile and Woodward. Over three months, the teams collected data that verified the basic premise of a digital divide while identifying other barriers, behaviors and conditions. Among the biggest findings, Dutton said, was the fact that most Detroiters find a way to access the internet at home with or without an internet service provider. While 60 percent of Detroit households surveyed have a contract with an ISP, 78 percent said they have home internet access. Even more people said they are online when they are out and away from home. Those responses, Dutton said, indicate the heavy use of mobile devices or smart phones to access the internet. "We saw that there is much more reliance on mobile smart phone access to the internet," said Dutton. "That mobile divide makes a difference. Even if you perceive you can do everything with a mobile, you actually end up doing fewer activities." Dutton said the research shows that people who are more reliant on mobile access are less likely to use the internet for work or school—in particular, for projects that involve writing and producing information. Mobile-only users also experience frequent limitations compared to home computers and laptops. Not all content is mobile friendly, including job and scholarship applications, school and work-related documents or other information related to essential services. "We have found time and again that the internet is an experience technology," said Dutton. "If people who are mobile only could get access to internet services through a laptop or desktop computer, they would have a better idea of the resources they are missing." The Detroit broadband study also deconstructed myths about patterns of use. Among the most prevalent was the idea that Detroiters go online primarily for entertainment. Focus group respondents reported that they used the internet "every day and everywhere," and their number one activity was checking email. Other highly ranked uses included getting information on local events, reading the news and searching for health information. Least reported activities included getting sports information, streaming videos and posting photos. Data also dismissed the idea that Detroiters are not interested in home internet access, with 60 percent of respondents without an ISP saying they would like to have one. Focus Group with Youth at Central Detroit Christian Community Development. Facilitated by MSU researchers Bibi Reisdorf and Laleah Fernandez. "There is definitely a need for more affordable access to all internet services," Dutton said. "The problem, too, is that more people are beginning to believe it's OK to be mobile only." Data revealed that the cost of home access represented a disproportionate part of a household's budget. Nearly half of those surveyed reported a household income far below the Detroit average of $26,000. Some participants admitted to delaying, avoiding or canceling other key services to ensure their family or kids had internet access for schoolwork, employment and job searches. While Dutton complimented the ingenuity of respondents to produce and access information via mobile phones, he reiterated that people could do so much more with the capabilities provided through laptops, desktop computers and associated software. He observes that academia has also not fully addressed the idea of mobile-only access, relying instead on the assumption that people have multiple devices to access the internet. The Detroit broadband study shows that to not be the case. "If you're mobile only, you're at a disadvantage in U.S. culture," said Dutton. "It limits your education as well as your chances to get a job. But we also recognize there is not a simple technical fix. Internet access has to be affordable. And there has to be awareness of the value of home access so we can better support and improve access over multiple devices in urban areas." Several members of the MSU Quello Center contributed to gathering, analyzing and presenting data for "Broadband to the Neighborhood: Digital Divides in Detroit." Team members included Bianca C. Reisdorf, Keith Hampton, Laleah Fernandez and William H. Dutton. For more information on the study and future directions, visit the project website.